Philip Davis with a case history from his multidisciplinary Centre for Research into Reading, Literature, and Society. A group of six ordinary people, led by a project worker from the outreach charity The Reader, is reading aloud together a mid-17th century love lyric by Robert Herrick. What can this – poetry, and old-fashioned poetry at that – have to do with mental health or psychological wellbeing? A loving heart to thee. That heart I’ll give to thee. And ‘t shall do so for thee. A heart to weep for thee. Dan does not usually like groups, and in this one he has feared, rightly enough, that he is the least educated member. The session is videoed and the recording transcribed for the work of my research group, the Centre for Research into Reading, Literature and Society (CRILS) at the University of Liverpool. CRILS has developed out of a university department of English literature, such that two literary specialists – myself and Dr Josie Billington – have gone to work with psychologists and health specialists in search of the uses of reading powerful literature in the wider world of human needs. This includes quantitative research, brain-imaging experimentation and physiological measures – about which I will say a little more later. But it is a mixture of cross-disciplinary methods that we must bring to bear in order to try to do justice to the multiple dimensions of reality existent in the wide range of people that The Reader reaches from all ages and backgrounds – in libraries and schools, in dementia care centres, in facilities for looked-after children, in prisons, hospitals, in drug and alcohol rehabilitation centres, in GP drop-in centres. The mission is to offer the shared reading of serious literature as a kind of powerful social glue that binds small communities of people together through the uncovering of strong personal feeling, normally suppressed or silenced in the cool or cold public world. Sometimes people come to the groups at the suggestion of a carer, or are referred by a professional, sometimes in response to advertisement or word of mouth: it is voluntary. Often they are not even people who would describe themselves as serious readers: they come with some scepticism and trepidation, perhaps thinking What can reading have to do with mental health and wellbeing? or How can something as seeming esoteric as an old poem have anything to do with my life now? I’ve always been so used to my opinion not counting. I feel as if I’m not being noticed. And that’s why when I started the group I thought, because a lot of the people read normally, I don’t feel as educated as them, being honest… I always feel as if I haven’t got anything decent to say basically. But because of the group, and they accepted what I said, and there’s certain people, tutors, yourselves, the way I was treated made me actually speak, because in other environments I wouldn’t usually say anything. See I would never ever say that to someone before, in a group situation I’d never tell anyone that. Because I even go on groups now, to do with helping me find work. As soon as I go in if they say anything and go you’ve got to stand there and say something, I go no, don’t even bother asking me. I’m not doing it. It’s because, well personally, I’m attracted to feminine qualities of nurturing and things like that. I don’t like aggressive situations. See it’s that commitment thing. [pause; commenting on ‘Bid me to weep’] It must be emotional. I just find loyalty, commitment, really good things, which I’ve not had. That’s one thing now, I’ve not thought that in the past… If you said words to me like ‘heart as soft’, ‘heart as kind’, kindness, I like those traits. There’s certain words that touch nerves with me, and that’s what I find. See whatever’s, ‘who may command him anything’, he’s going to do for her, he’s going to look after her. And even though I’m not that type of person, I’m usually a cold person. Interviewer: You’re usually a cold person? No not so much, that’s what I try and be, that’s what I act, I act as that, that I don’t care, when I do care. In the qualitative analysis, the CRILS research team looks very carefully at the language, not only of the poem but also of the group-participants themselves, as affected by the poem and nuanced through the reading of it. Two phrases of Dan at interview stand out in this respect, and again both of them relate to the negative, only now in a transformed way: I just find loyalty, commitment, really good things, which I’ve not had. No, not so much [a cold person] … I act as that, that I don’t care, when I do care. There is no missing the default emotional defensiveness described in the second quotation. But it is the first that has interested us most: ‘really good things which I’ve not had’. This is not about reading as a form of therapeutic identification: Dan is a single rather lonely person. His connection is not based on memory as such. What is surprising is that what is missing is not experienced here as a simple negative, a sadness and lack in his life, a cause of mental ill health. It is felt still as an ideal, as a human possibility for love regardless of his own personal lack of success in that area. But Angela loves it although she has never had anything like supportive parents – although and because. This is wish-fulfilment: she knows every well that this is something she has not had as a child, still suffers from in her struggle to stay afloat in life, and cannot now ever have in future from a parent. But the deprivation and the damage are here used in creative response and not simply lamented. They are used not as memory but as imagination, holding on to the importance of such things precisely by knowing how much it means not to have them. Those who have less (in life) can often give more (to the poetry’s meaning). You can mess about with it. But what they want to hear is – well, personally what I thought they wanted to hear was – ‘Yeah I had a really bad day the other day, I really fancied a drink but I sat down and I thought no, it won’t be just one, it’s never just one, so I got through it’ and they’ll go, ‘Oh well done’ and I’d walk out of there and go ‘Psht’... If I was getting only comfortable thoughts in all the groups that I was going, I would not change my behaviour. Because, because, I’ve been through groups before and I’ve sailed through. What with books and poems, it makes you look at things honestly. And it’s harder to lie around them… This is, it’s about feelings, there’s feelings so you’re talking about feelings. That (therapy groups) you’re talking about actions. At this point emotions begin to reclaim their original evolutionary value. Useful initially as responses to external reality, here they are reclaimed as urgent and as messages of feeling that tell of a psychological reality that should not be ignored at a higher evolved level of survival. Literature is about the human ability to use and not simply deny so-called negative material: ask any poet or novelist. That complication of simple positive/negative oppositions translated into this result when we used quantitative affect measures such as PANAS (Positive and Negative Affect Schedule): our colleague Rhiannon Corcoran has found statistically significant specific change for the better in the facet of psychological wellbeing labelled ‘purpose in life’. What we are interested in is the added human meaning and value that literature both prompts and preserves. We are currently using physiological measures to test changes in blood pressure, temperature and galvanic skin response to look for deep-physical alignment between members of the group at moments of high-level mental and emotional involvement with the literary text at its most powerful. 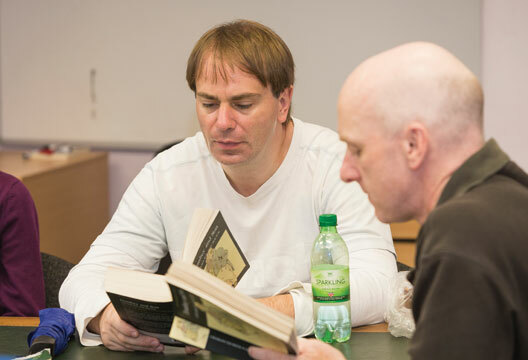 We have already carried out a number of brain-imaging experiments to show how this kind of excited and immersed reading creates an animating sense of surprise and change, a shift from overgeneralisation, rumination and the entrapping default mechanisms that imprison people in limited habits of predictable response. Rhiannon Corcoran has called the shared reading model ‘psychology in action’; another of our collaborators from psychology, Richard Bentall, has called it ‘implicit psychotherapy’. We hope its dynamism will be of interest to psychologists everywhere. See www.liverpool.ac.uk/psychology-health-and-society/research/reading-liter... for projects, reports and publications. Davis, P. (2008). Syntax and pathways. Interdisciplinary Science Reviews, 33(4), 265–277. O’Sullivan, N., Davis, P., Billington, J., et al. (2015). ‘Shall I compare thee’: The neural basis of literary awareness, and its benefits to cognition. Cortex, 73, 144–157. Thierry, G., Keidel, J., Gonzalez-Diaz, V. et al. (2013). How Shakespeare tempests the brain. Cortex, 49, 913–919. Thierry, G., Martin, C.D., Gonzalez-Diaz, V. et al. (2008). Event-related potential characterisation of the Shakespearean functional shift in narrative sentence structure. NeuroImage, 40, 923–931.